According to UBS and the Economist's "alternative Big Mac Index" which looks at average salaries and cost of living, Chicago is one of the cheapest cities in the world to live in. The only cities where an iPhone is more affordable, in the world, are New York, Copenhagen and Zurich. 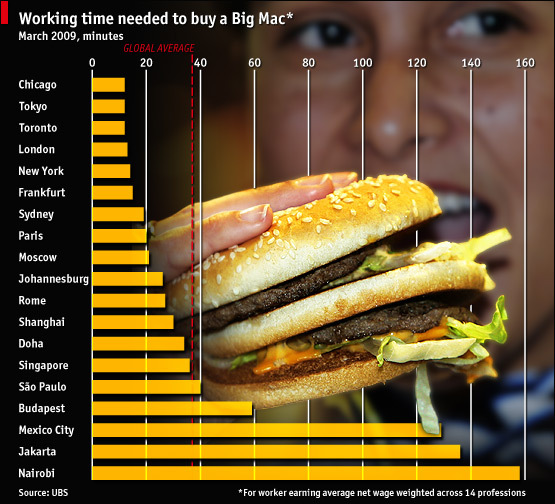 In 2009, a study compared average salaries with cost of living, and found that, in the average Chicagoan would need to work about 12 minutes to earn enough money to buy a burger. The global average was closer to 38 minutes.